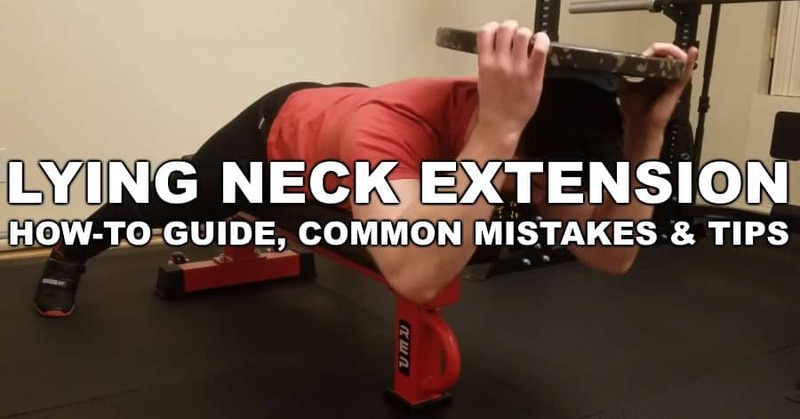 Is the Lying Neck Extension Right for You? Find a flat bench or an adjustable weight bench that’s in the flat position. Before lying down, put the weight at the end of the bench, on the floor. This way, you can easily pick it up once you’re in position. I recommend also putting a towel over the plate, which will serve as a protective cushion between the plate and the back of your head. Stand at the other end of the bench so that you’re facing the end of the bench where the weight plate is. Straddle the bench and use your arms to safely lower yourself into the prone (face down) position. Adjust yourself so that your head, shoulders and upper chest should be over the edge of the bench. You want enough room for full range of motion in bending and extending your neck (and the highest part of your thoracic spine). Plant the balls of your feet on the floor in a wide stance. The goal is to stabilize your torso during the exercise. 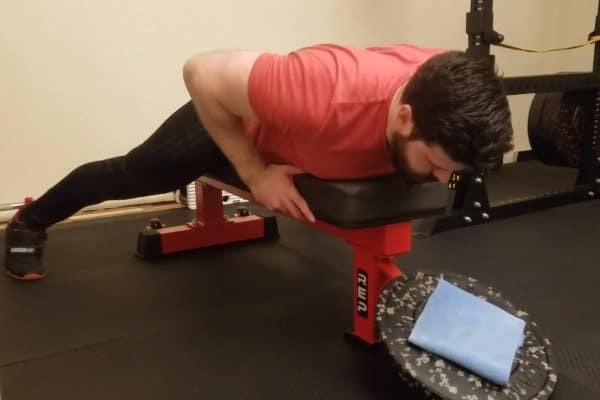 Grab the weight plate, using your thumbs to hold the towel in place. 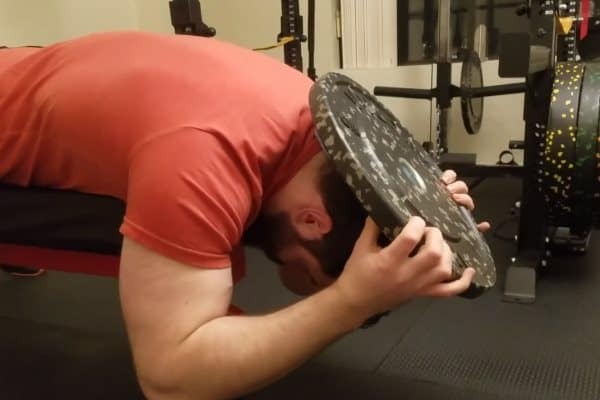 Lift the plate up and carefully flip it over and position it so that it rests on the back of your head. Use both hands to support the plate on either side. Don’t use your arms to lift plate, and make it easier on your neck muscles. Remember to keep your elbows tucked in. Before starting your neck should be in a flexed position. You should be looking down such that you can see the foot of the bench beneath you. Inhale prior to initiating the movement. Initiate the upward movement by lifting your head and arms in unison. All tension should remain on the neck muscles. The hands/arms are just there to balance the weight on your head. Keeping the elbows tucked will help make sure the arms rotate upwards in unison with the head, and don’t accidentally take the stress off the target muscles. Continue to lift the head slowly until the head has lifted slightly higher than the shoulders. No fast or jerking motions. You can exhale during the concentric or at the top of it. Hold the contraction at the top of the rep for about a second; you can go up to two seconds if you’re trying really nail the form. The head should be just slightly above the shoulders, not craned or over-extended up. Depending on the height of the bench, you should be able to see about a foot in front of you. Your chest may lift slightly of the bench at the top of the rep. However, your lower rib cage should never lift off the bench pad. You may feel the uppermost part of your back working at the top of the rep. This is normal. Just don’t try to overextend — You’ll be fine as long as you keep your lower rib cage in contact with the bench at all times. Lower your head at a controlled pace back to the starting position, such that you’re looking at the foot of the bench beneath you. Do not just let the weight bring your head down; resist its weight as you lower it. Your hips should remain in contact with the bench at all times. They may have a tendency to rise up as you bring your head below the top of the bench, so try to resist this. The arms should move in unison with the head as it flexes forward. Control the arc of the head all the way to its bottom point, do not flex your neck further than necessary at the bottom of the rep as if to pull the neck into the chest — this serves no benefit and puts undue stress on your neck vertebrae. Briefly pause at the bottom of the rep.
Inhale just prior to beginning the next repetition. The head should be downward but not tucked in excessively. Use a higher rep range of 20-25+. Generally speaking, high reps work better for building the neck compared to most other muscle groups. 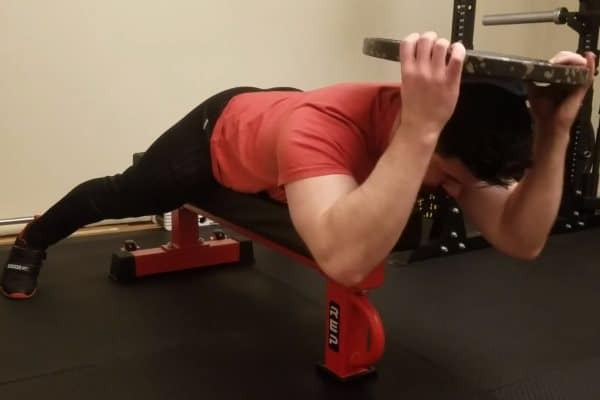 Also, staying in a higher rep range means the weight is relatively lighter, and therefor is safer; safety is a big consider particularly when training a potentially sensitive area like the neck. 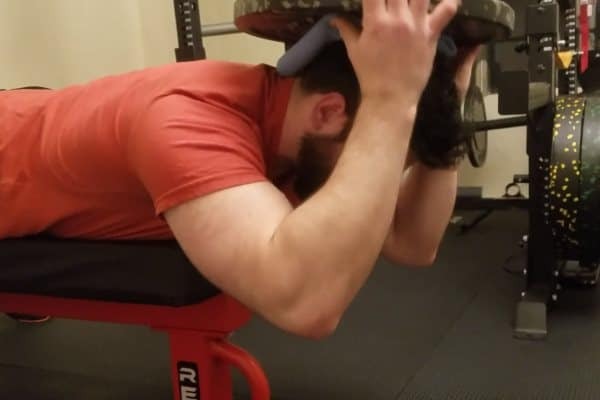 Lastly, due to the difficulty of loading very heavy weights onto your head from a prone position, using a higher rep range will allow you to progress much longer before the weights become too heavy to lift onto your head — as compared to if you were using relatively heavier weights for low reps.
As you reach the top of the rep, retract your neck (think of tucking your chin straight back into your face). 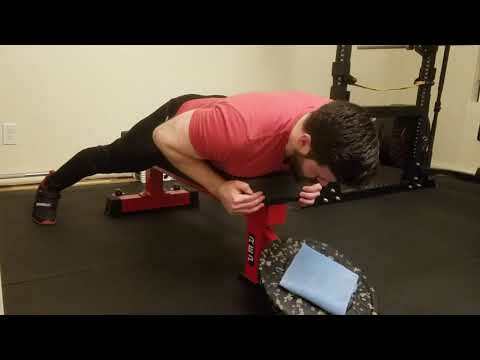 This allows you to strengthen the often weak deep neck flexors, while still intensely training the target muscle of the splenius (and the other lower neck extensors). This way, you can maintain if not improve your neck posture while still building up the back of the neck. Keep the lower rib cage and hips on the bench at all times. Using a wide stance, a controlled tempo and proper range of motion will keep your body where it should be on the bench. Always keep the hands on the weight plate to support and balance it. Do not use arm strength to cheat and lift the weight for you. Make the sure the elbows move in unison with the head and neck. Tucking your elbows is the most helpful cue for achieving this motion. Inhale at the bottom of the rep and/or during eccentric motion. Exhale during at the top of the rep and/or during the concentric motion. Hold the isometric contraction at the top of the repetition one second (up to two seconds if working on technique and muscle activation). You should be looking about 12 inches in front of where your head is at the top of the repetition. Don’t try to look straight ahead and overextend the neck. Stay relaxed at the bottom of the rep, and avoid actively flexing the neck into the chest. The lying neck extension can be a fantastic exercise for building strength in an oft-forgotten portion of the posterior chain. The neck extensors work in synergy with the erector spinae and other key posterior chain musculature which is critical for stronger pulling muscles and exercises such as the deadlift. 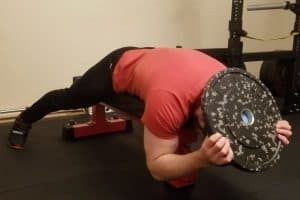 In addition, strong neck extension is a critical component for any activity that involves contact to the head, such as martial arts, football and tactical practitioners such as police officers and military. It is also suitable for the general population as many people tend to have kyphotic posture or forward neck posture from extended time at desks and looking at phones, and strengthening the neck extensors can help combat that. If you have previous neck injuries such as whiplash, always consult with a medical practitioner prior to beginning neck exercises. 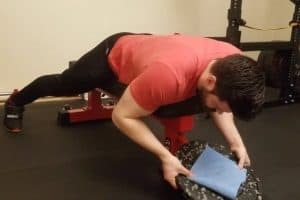 If your main focus is building a thicker neck, the lying neck extension (or any neck extension variation) should be included in a well balanced neck training routine. However, if you had to choose just one neck training exercise for aesthetics, it would be a neck flexion exercise such as the lying neck flexion. That’s because neck flexion movements train the sternocleidomastoid muscles, which are largest and most prominent muscles on the front/side of the neck. Luckily, though, you don’t have to choose between flexions and extensions. You can do both!